Oh my where to begin! 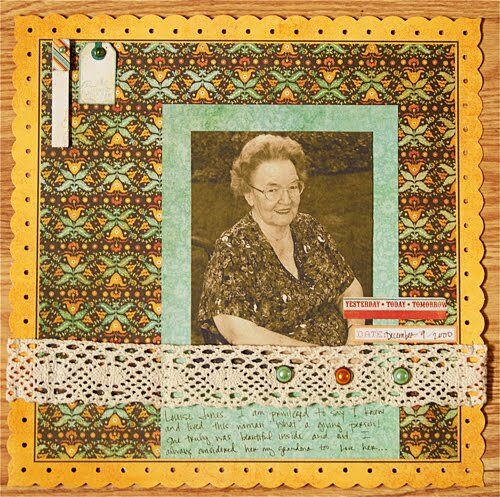 If you are a reader of this lovely site, then you know that Mabel was one of my top picks from the CHA show this past winter. I loved it then. Well let me tell you, that love was well founded and now is complete!! LOVE LOVE LOVE! Alright let's get started and let me gush. -I loved the stamps! They are of great quality and give a great clear image! -I really like the texture and weight of the patterned paper. This is one of the many things that makes My Mind's Eye's papers great! -I love that the 6x6 paper pad is....wait for it......DOUBLE SIDED! I know right!? FABULOUS!! -Basically what everyone else has already stated. A lack of coordinating alphas. That would have made this absolutely perfect. Bottom Line: Honestly this line is just perfect for me. I am shabby lovin' gal who likes to make clean projects as well. I think this was perfect for both! What do you think? Do you love this line, it's okay for you, or do you just not like it? Let us know! Leave a comment by midnight EST on Thursday to win a prize pack from My Mind's Eye. I like this collection also, especially the stamps. I have really been pleased with MME despite the fact that they don't really offer any alphas!! Just gives me a chance to use all my favorite OA Market stickers and AC Thickers with my beautiful papers! beautiful collection! love the colors and the stamps. I love this paper. I"m actually just as fond of what is on the OTHER side of this one die-cut paper...its gorgeous. I do love the color palette of this collection. I do wish there were alphas with it too but MME is one of my favorite companies. I have been admiring this set of stamps for weeks! I love the colors in this line - great projects! I love this line! I think the colors are just fabulous. And those stamps!! I love love love love it. Love the colors, love the patterns, and I love those brads! Can't wait to use some! Gorgeous projects! I am loving the stamps in this line! Great colors and multitude of uses. I really love this line and I'm not a girly girl scrapper but this has a great timeless appeal! soI'd love to play with this collection!!! Love the colors and the stamps look wonderful. I must be real exception-I never use the matching letters that come with anything!Makes MME one of my top favorite companies.One lest collection component I feel obligated to buy. This is so far my favourite line of all time. Love everything about it! I really like this line, but my fave is the decorative brads. Adorable! First of all- congrats to you for making GCD team.. As for this collection- I love it.. Letters or not- I can cut them at home.. Love it.. I love every one of these collections! The colors are beautiful and the embellishments are perfect! Can't wait to get my hands on some! What a wonderful collection. 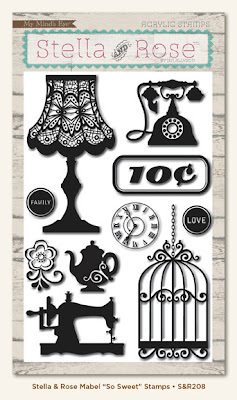 I really love the sewing machine stamp...I certainly would love to experiment with all of the products. Thanks. Wow! I love MME and these stamps are wonderful! I love everything from the MME Stella & Rose line! Those stamps are just so beautiful too! Love this line!!! I want those stamps sooooo bad. I love this collection... the cllors and patterns are wonderful. I saw these at CKC the other day and the colors in person are amazing, love them! 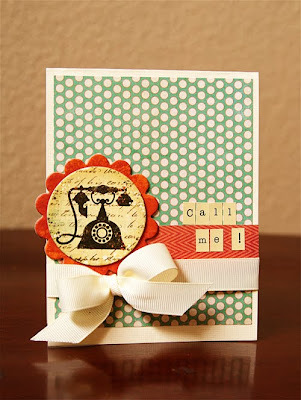 Love the vintage look of the stamps and coordinating paper...whoo hoo! Love the colors!! I think the orange is fabulous!! Love the projects you made!! I love this line so much!! Those are the cutest stamps ever!! The lamp, bird cage, telephone!! Love the colors too! I am in love with this line! I am really into the vintage looking items these days! I have to agree with you, the stamps are my favorite too! Thank you ladies for thse informative and inspiring posts on MME. I love, love, love MME! And, I would love, love, love to win some of these gorgeous goodies! I've always loved mME. 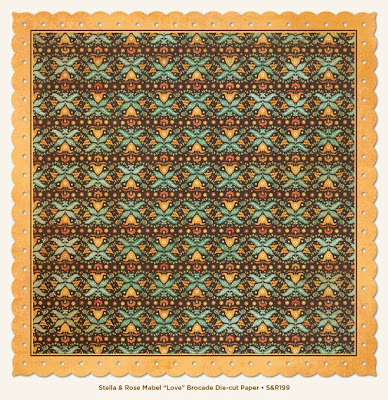 This new paper is gorgeous! I can't wait to play with it! Beautiful layout and cards! I love MME! Wonderful! Those clear stamps are musthaves, the brads are so fun, and I love the color palette! I like the intricacy and I have a thing for orange atm. What great projects! I love the Call Me card. Thanks for the inspiration. This collection is on my wish list. 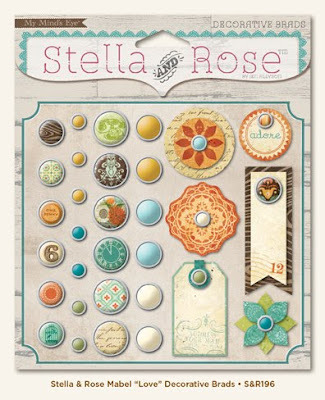 yes i like this one too- My Minds Eye has hit it out of the park with their Stella & Rose Collection! 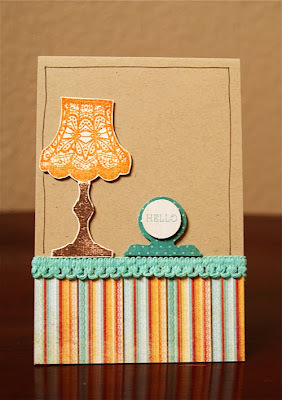 I really like the orange hues in this collection and the stamps are so vintage and fun. The quality of their papers is always a plus as well. Great use with your projects. It seems to me that it all just looks good, defintiely a must have! I love the MME Stella & Rose collections! I love them all so much I can't choose a favorite - I guess that means I need to get them all! Love, love, love it ! Love it! MME is always fabulous! It's a gorgeous line, I've made some projects with it already and the results are just great! I agree with you, Wendy! I LOVE this line. I love the colors, the patterns, and the versatility! Cute colors and wonderful projects! Absolutely love those stamps. Very cute. I want one or two of all the new MME lines! Love all of them!